I’m currently 38 weeks pregnant with my 4th baby and determined to stock my freezer with 40 homemade delicious meals. I started with 15 beef and pork crockpot freezer meals and just added 10 casserole-type dishes. Here’s what I made, including my recipes and shopping list. 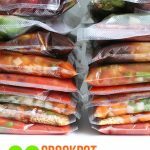 If you want the recipes and shopping list for the 15 beef and pork crockpot freezer meals that I made, CLICK HERE. These are all recipes that we love and make over and over again. 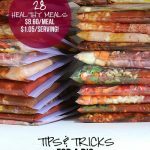 They are awesome freezer meals for any new mom. I can’t wait to eat them! Only the chicken pot pies and Mexican stuffed shells required any cooking ahead of time. 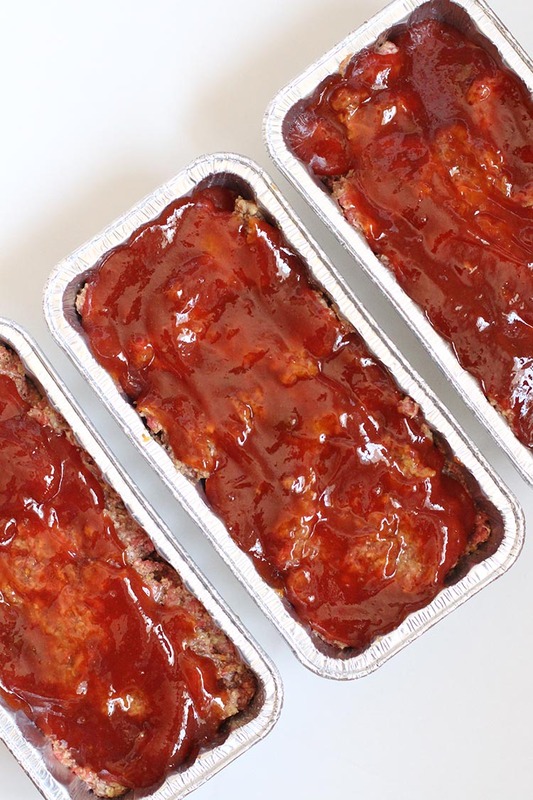 The meatloaves, stuffed mini peppers, and lasagnas were all frozen raw. That means they’ll cook for the first time out of the freezer and won’t taste like leftovers at all. Yay! 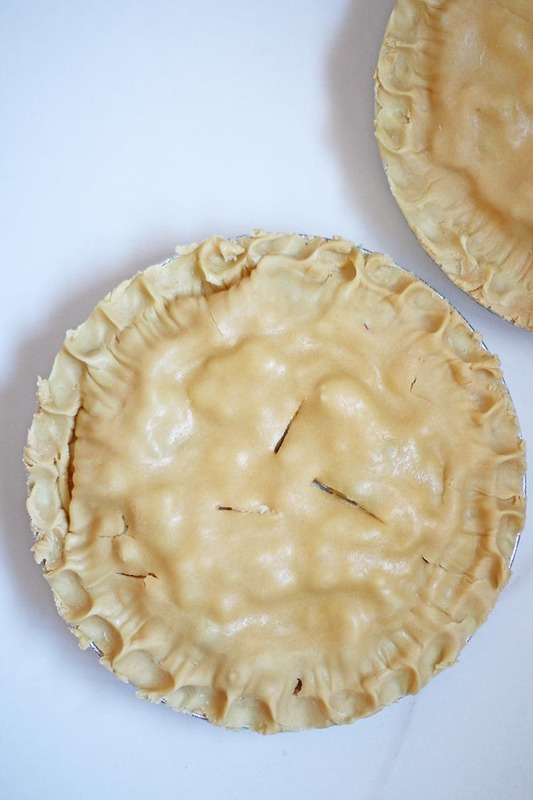 Since I blog from home, I made one recipe per day for five days. IT WAS HORRIBLE. I hated having something extra to do every morning in addition to my everyday tasks, like making breakfast, cleaning up the house, and switching out laundry. If I could go back in time, I’d set aside three hours on the weekend and make all 10 at once. That’s what my mom and I did when we made the the first 15 crockpot freezer meals and it was so much fun. To make these 10 casserole-type dishes, I spent $88 on groceries at ALDI and my local grocery store. Not bad for 10 dinners! I also bought these cheap disposable pans with lids from Amazon so they would stack nicely in my freezer and not put a bunch of my glass and aluminum pans out-of-commission. I’m storing all of the meals in an extra freezer in our basement. They should last three to six months, but I have a feeling we’ll eat them before then. Next up is 15 chicken crockpot freezer meals. I’m going to make them with my mom this weekend and then my little man is welcome to come anytime. Yay! Check on Instagram for a photo of my stocked freezer. This happened to me when I froze chopped onions. Everything now tastes like onions, even my ice cream! I tried baking soda but that did not work. Anyone out there have any suggestions? I have no idea. That has never happened to me before. Are you sure your freezer is cold enough? They’re really not spicy, Carol. I’ve never had a colicky baby, so I’m not sure if certain foods aggravate colic more than others. how do you like your new food saver? Hubby got me one as an early Christmas present. I don’t know that it will save money (with the cost of bags), but I am giving it my best shot. Oh, I’m obsessed with mine! 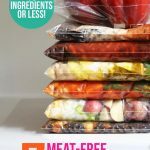 The rolls of bags are so much cheaper than regular freezer bags!! Great recipes! thank you! From a working mom. Thank you for the encouragement, Kathy. 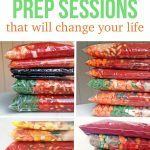 I am 39 weeks pregnant with my fourth and have the same goal as you…stock my freezer! So far, I’ve made your 6 meatball meals and am working my way through your Costco freezer meals today. I will add some of the casserole type dishes, too! 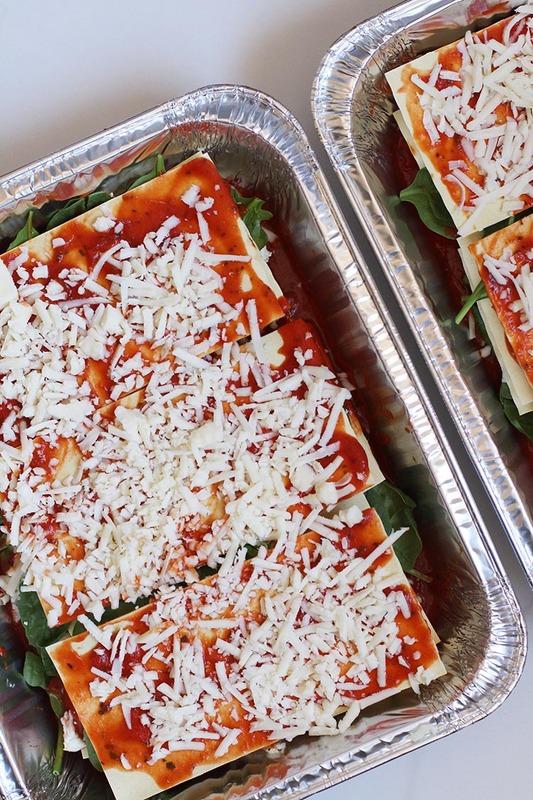 Thank you for your well-organized, well-thought out recipes…and best of luck with number 4!